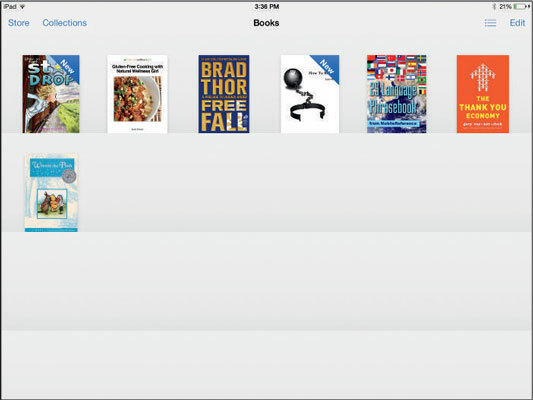 With the bookshelf version of the library displayed, tap the List view button shown in the top-right of this figure. Your books appear in a list, as shown. Switch back and forth between Bookshelf and List view using these buttons. Organize your titles in various ways. To organize the list alphabetically by Titles, Authors, or Categories such as Series, tap the appropriate button on the bottom of the screen. For example, if you tap Categories, your titles are divided by category titles such as Fiction, Mysteries & Thrillers, or Literary. 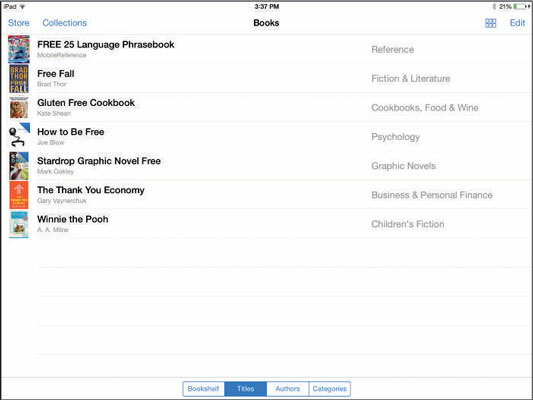 Tap the Bookshelf view button at the bottom of the List view to remove categories and list the most recently added book first. Use the Edit button in List view to display small circles to the left of all books in the list. Tap in any of the circles and tap the Delete button at the top of the page to delete books, and then tap the Done button to exit the Edit function.